I have an SSRS Report with a default date parameter. In an SSRS report I wanted to have a Default date parameter. When this report is opened the cursor is focused in the “Person ID” field, and the End Date is grayed out. Enter a PersonId and either tab out of the field or click view report and the End date field will become available. The problem can be resolved by changing the order of the parameters. It appears that placing a text style parameter that requires user input prior to the default date field, stops the parameter execution and leaves the field grayed out. You have a SSRS report which is grouping by a category. Assume you have 6 items in two groups. 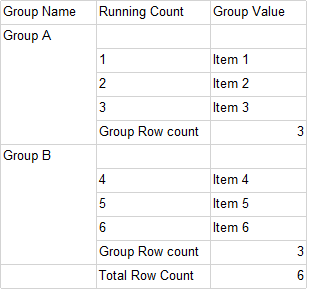 You want the first column to be a running row count across the groups. This is a long sought after and requested feature, and finally in 2008 R2 it’s here. Set this and then on export to excel the tab will use the page name. This can be set on certain objects in the report and can use Expressions to set the name. As an example of how it works, I have a report that runs as 2 sub reports. Each subreport has a tablix that has the page name property set. When the report exports to excel I get 2 tabs each named as defined in the page name property. Another more complex example is using a tablix with grouping. Set the tablix to page break on the element that you are grouping by and then set that element as the value for your page name. Each time the grouping changes it will render in a new page and if exported to excel each tab will appear with the name of the group. Every now and then in my travels around SSRS I have needed to do this. You may be unsure if the version of the report deployed to production is the version of the report in source control and just want to get latest off the production server. The way I have normally had to do it is to connect to the Reporting services server, go to the properties of the report and then choose “Edit” or in SQL Server 2008 R2 choose “Download”. I found this tool the other day, and I must say its awesome. http://www.sqldbatips.com/showarticle.asp?ID=62, it’s called the “Reporting Services Scripter” and I have a new friend. Not only can it extract files from a given server if you have the correct credentials, it will also create a deployment script. So now the pain of releasing files to production one by one can be avoided and having to manually configure things again and again. This is all scripted into a batch file that can then tweaked to point to the production server and this can then all be wrapped up neatly into a release. EDIT: The site has seemed to have gone down but this link is the direct download which is still working. EDIT 2: the above link also seems to be broken, here is the last know copy that I have, I am sure they won’t mind me redistributing..
Also here is a link that provides the full process of how to use the tool. As of SQL Server 2008 R2 the way to make headers of tablix’s repeat has changed considerably. In short all the documentation I found suggested you needed to turn on the “Advanced Mode”. Advanced mode is a bit hard to find. and keep looking right and you see the innocent little black down triangle. Click that and choose advanced mode. Click on the static elements and it will highlight a cell in the report, this identifies the element you are attempting to change. So its been a year or so since I wrote this and in a case of dog fooding, I had to fix up a report and I hit the same error as listed by nes, itch and Terrence below. Here is what the header Row Groups looked like in my report. So I followed my own instructions and setup the row group properties on the static row immediately above rsvp as per my instructions, ran the report and got a similar error to Terrence. 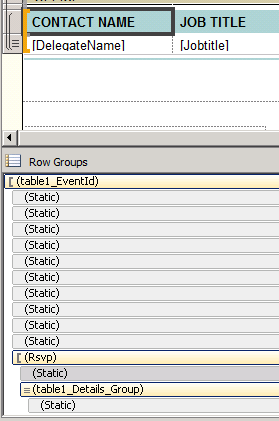 Assuming that you need all the header rows to repeat on each page, then you need to configure EVERY static row in the row groups in the same way, (every row between table1_EventId and Rsvp). Get one of the properties different and you get that error. Assuming you don’t need the entire section above to repeat on every page. I needed to only have the table header row repeat. (the last static row prior to RSVP contained the details of the table column headers). I right-clicked on the RSVP row Group, chose Insert Row –> outside Group – Above. This inserted a single blank row. Copy the header columns from the row that is now in the outer group, and paste into the new row that appeard. Delete the previous header row. Now follow the instructions above. As there is only 1 row then the repeating header instructions above will work. The trick is that to have the header repeat you have to update every row at a level in the row group to have the same settings. I needed to do this the other day, after an hour or so I finally got it. Issue, I have an images directory that is deployed to the report server with my reports, It is hidden in the tile view. The problem, how to insert an image into my report that references the images directory hosted on my report server. [rsWarningFetchingExternalImages] Images with external URL references will not display if the report is published to a report server without an UnattendedExecutionAccount or the target image(s) are not enabled for anonymous access. 2. This expression uses the localhost when in the IDE preview window and the full reportserverUrl when deployed to a server. I didn’t want to hard code localhost for a production deployed report. And now it all works both in the IDE and the deployed report. Just cost myself a few hours on this one. I have recently installed the 2008 R2 Nov CTP, I also have RS reports that use a custom assembly. The thing was that my report was running successfully when I deployed it but not when running in BIDS – (Business Integration Development Studio). Updating this policy file fixed my issues. If you use the IIF statement to solve your divide by zero errors, you will most likely find that you still get divide by zero errors. We need to try to make the false result not error when working days = 0. When working days = 0 the result is going to be 0. So we don’t really care what the false result is going to be we just don’t want it to error. So the new IIF statement on the denominator returns 1 when the working days are zero. and this does not error. In short by converting the zero to a 1, it stops the false result from erroring and allows the calculation to work correctly when it is evaluated. That is a work around for a problem that should never of existed, good one Microsoft.. I got this error the other day whilst trying to install Reporting services. In short the performance counters on the machine were corrupted, so the following command rebuilt them and fixed the RS Install error. Solution was to run the command above, uninstall, (I removed all SQL Server 2008 components) and re-install from scratch.